We wrote about and photographed this Pakistani stall near Kuala Lumpur's Masjid Jamek last fall for KLue magazine. We met Osman, its shy but very sweet owner, at his Deepvali punjabi sweets stall in Brickfields way back in 2005, but it took us another year to find our way to his Pakistani savories outlet. 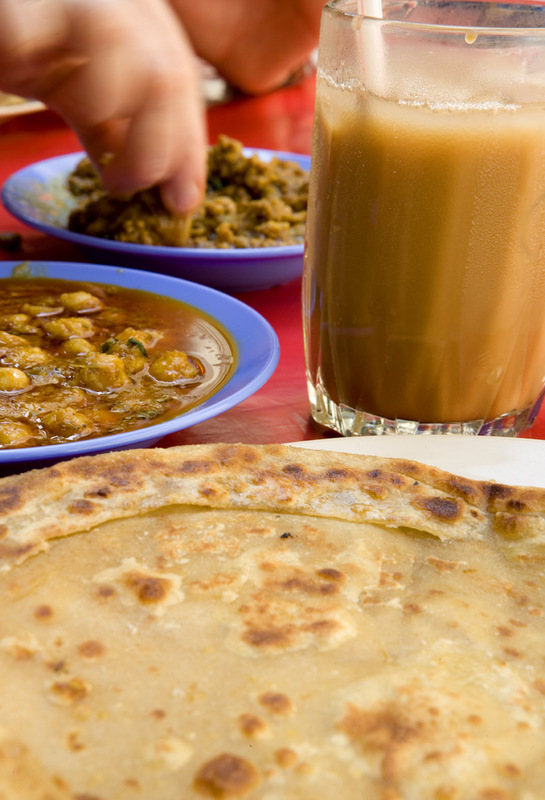 It's now firmly on our list of favorite downtown KL nosh spots. 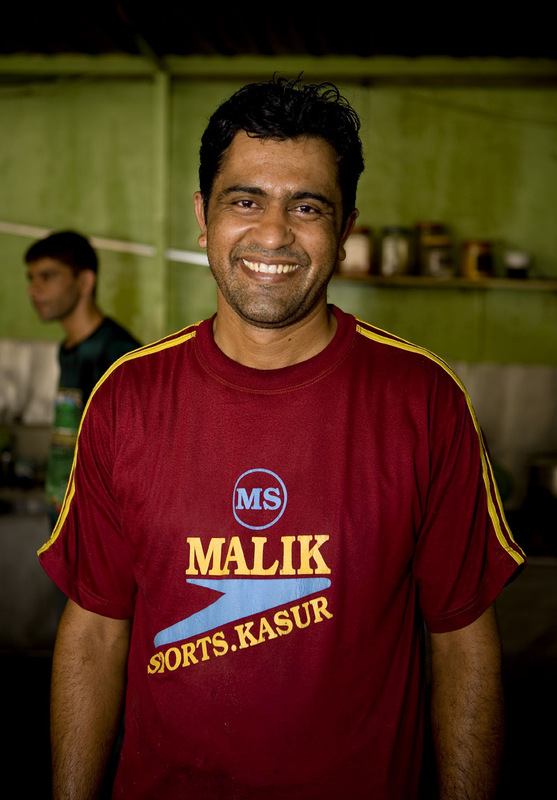 On Saturday morning we stopped in to find that Osman is (temporarily, we hope) back in his hometown of Lahore. For now the kitchen is in the capable hands of his serious cousin and a new employee who proved himself deft with a rolling pin, griddle, and spatula and easy to smile for the camera. This was our first encounter with this kitchen's paratha (we usually go for its wonderfully chewy naan, and cart home 10 or so additional to pop in the freezer to boot), which Osman encouraged us to try on our last visit. The griddled disk placed before me was so hot it burned my fingertips. After a couple painful attempts to tear off a piece I momentarily gave up and leaned over the plate. My head was immediately enveloped in a cloud of vaporized ghee and toasted wheat. 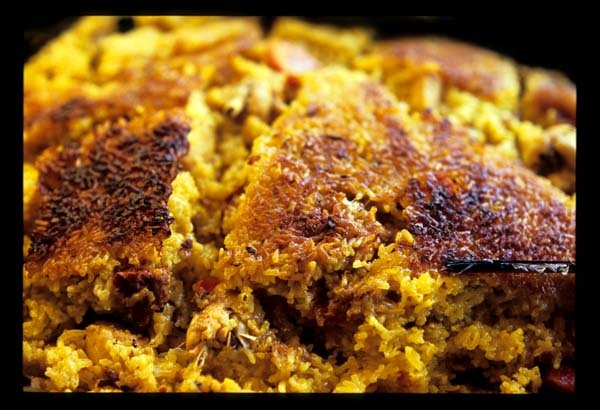 At around 10:30am a number of dishes had yet to come off the stove, though that mattered little, as our favorite of Osman's specialties was already finished. As I write this I feel an obsession beginning to percolate, an obsession that I'm pretty sure will one day land me in Lahore. Nihari, a spiced stew of long-simmered meat, is considered a hangover remedy. Osman's version is made with chopped beef, plenty of ghee, and peas. It feels wrong to call a meat dish 'silky', but that's what Osman's nihari is -- earthy, complex, and yes, so unctuous and silky with ghee it glides over the tongue, past the molars, and down the throat with no effort on the diner's part at all. It's incredibly comforting, like a rich and meaty ragu Bolognese. We packed some home, in fact, to toss with pasta. I don't want to give short shrift to the other dishes. 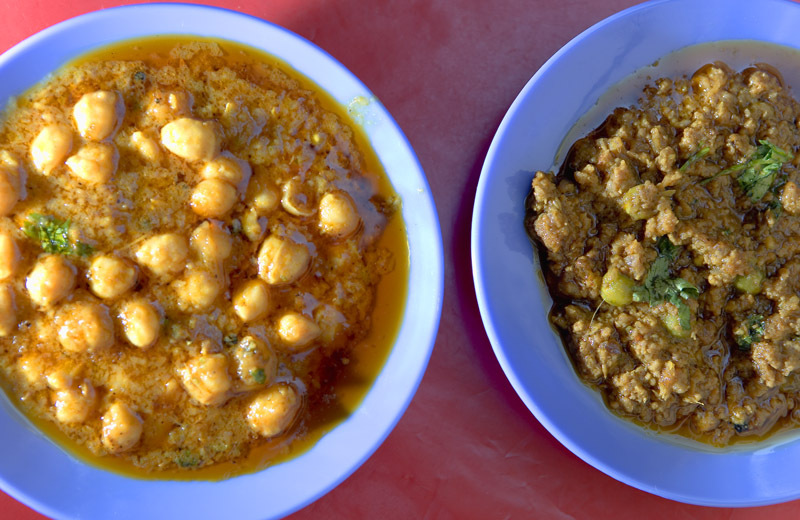 Our chickpea daal sparkled with cinammon and, after few benign moments, stung with chili. We stopped there, with nihari, chickpeas, and paratha. It was only 10:30 in the morning, after all. But we know from past experience that everything made in this kitchen - lamb curry, keema, lentil daal - tastes like the best kind of cooking: homestyle. Pakistani stall, near the end of Lorong Bunus Dua (Maydin at the corner), off Jalan Masjid Jamek, KL. Look for the bright green kitchen and the tandoor oven. Open from about 900a. Biryani on Friday, nihari on Saturday, haleem on Tuesday. 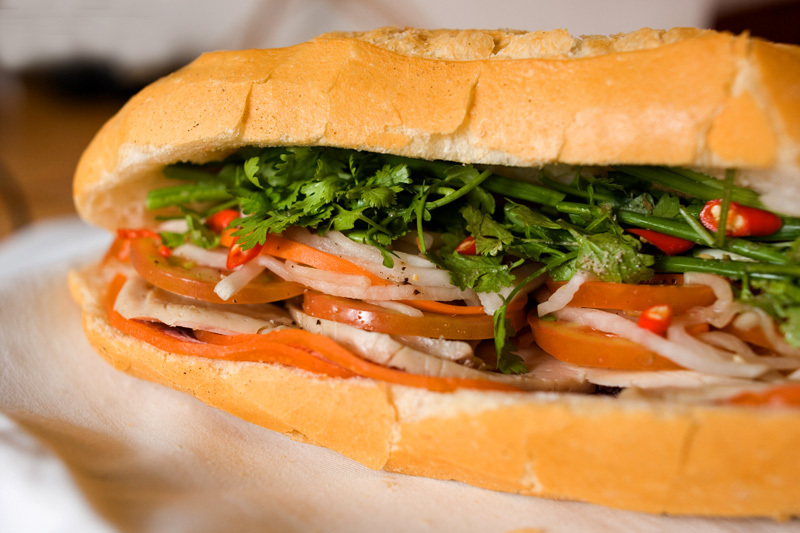 In the two and a half years that we lived in Saigon I never once ate banh mi. Don't know why exactly. I suppose that when mealtime or snacktime rolled around all the other choices seemed so much more compelling. Don't hate me because I'm an idiot. I tried to make up for lost time when we were in Saigon last November. Led by Dave (a sandwich connoisseur from way, way back), I downed at least one banh mi day. In a few weeks we'll be heading back to that hot and steamy city by the river, and a more thorough survey of the Saigon sammie scene is high on my 'To Do' list. I'll start with my favorite version from last trip, served not from one of the city's ubiquitous mobile banh mi carts, but from a folding table set up in front of a general store in District 1. We stumbled across this banh mi master after a couple rounds at Cafe Latin, perhaps the only bar in all of Asia that does a real pour. We'd already had dinner but the crowd coalescing around this man and his sandwich ingredients made the question of whether or not we really still had any appetite seem rather trivial. What especially drew our attention was the portable charcoal grill upon which he lay each butterflied baguette (soft side down) before stuffing it silly. 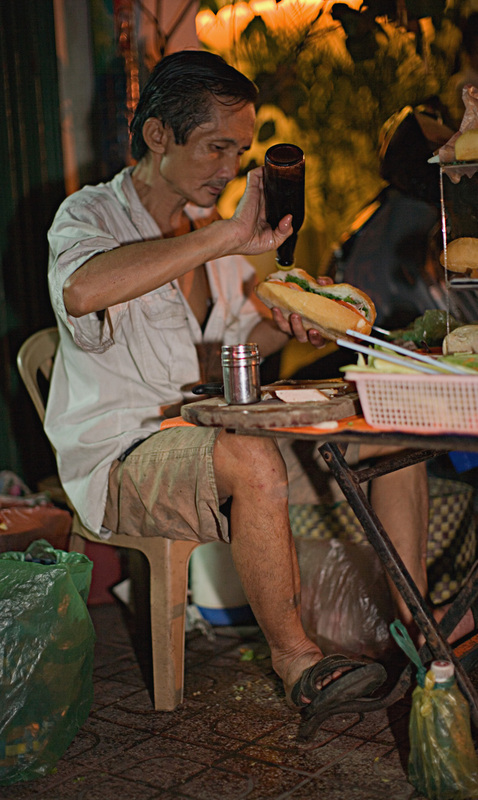 His banh mi was so good we returned - Dave with camera in hand - the next night. Alas, no grill to be seen. We later learned that the vendor, who's been sating local late-night sandwich cravings at this spot for at least the last ten years, fires up the barbie only when he's got day-old bread, left over from the night before. If he's not smokin', as it were, you know his bread is fresh. 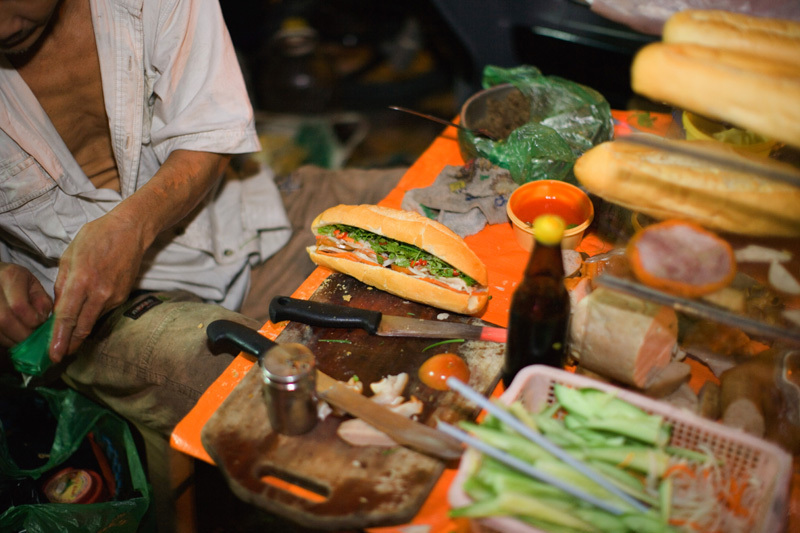 I'll wager that this will be the only post in which I'll advise you, if you find yourself in Saigon on an evening and craving banh mi, to cross your fingers for day-old bread. A warm, slightly smoky, crackly-charred baguette-ed banh mi is something extra special. But his fresh-bread version is pretty divine in its own right. We ordered the works - which included various charcuterie and a lusty liver pate that he spread quite thickly on one half of the loaf, carrot and daikon pickle, tomato, plenty of crunchy cilantro, a generous shake of that fragrant Vietnamese black pepper, and, I think, Maggi sauce - and bundled it back to our hotel where we could enjoy it with a beer (and Dave could photograph it in good light). 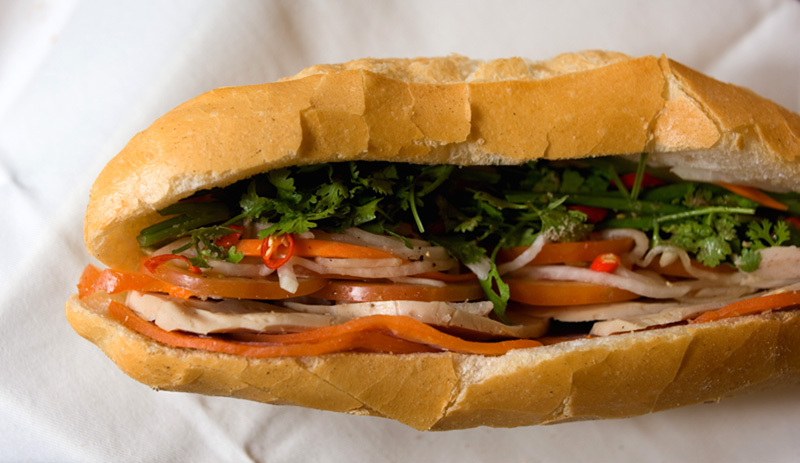 Just writing this post leads me to sorely regret, all over again, those 30 banh mi-less months. 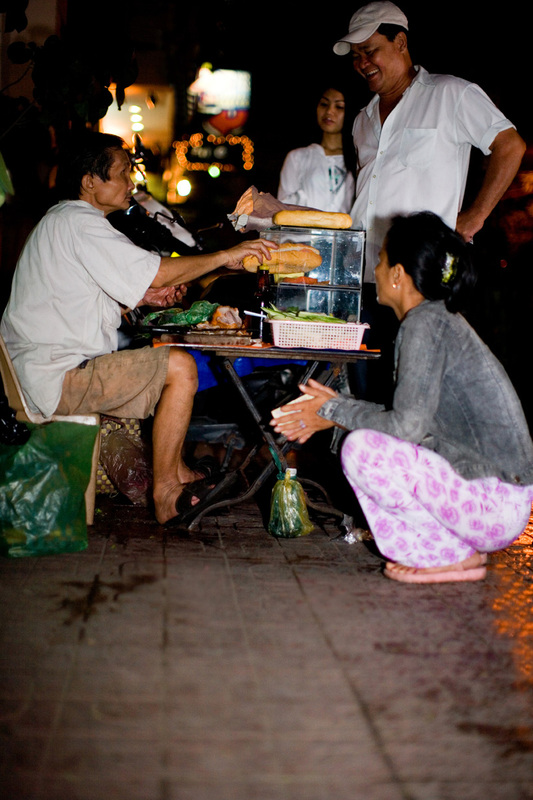 Banh mi vendor, Mac Thi Buoi Street near corner of Hai Ba Trung, District 1, Saigon. From 10pm till ? What sound do frogs make? In America it's 'ribbit', but on Bali it's 'genggong'. Try saying it over and over, really fast - GEHNG GAWNG GEHNG GAWNG. Run together, the words actually do sound like the song of a lovesick or angry frog. 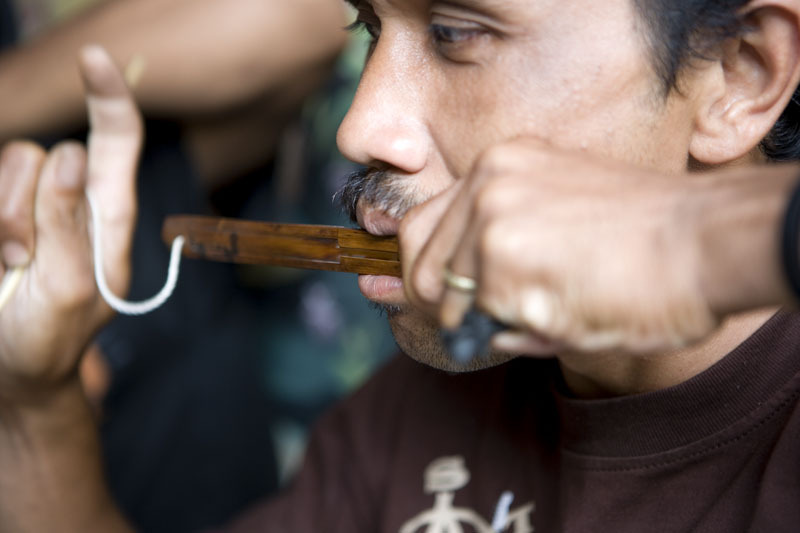 Genggong is also the name of a traditional Balinese instrument, a jaw harp made from bamboo. 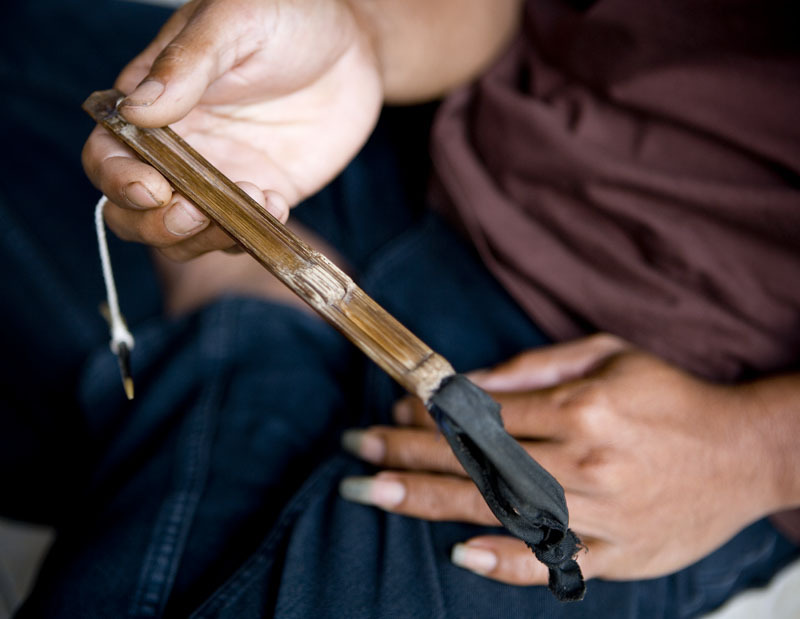 When we were in northern Bali in March we got to talking Balinese instruments with our guide, and he asked if we'd like hear some live genggong music. We drove through thick foliage past rice paddies just shorn of their harvest, to a small village where the members of the last genggong group in the area live. Genggong music is not as well-known as gamelan and there are, we were told, not that many craftsman left who make play-worthy instruments. The instrument maker in this village, who died a couple years ago, had no one to pass his knowledge on to. This is just a bit of the genggong we were treated to that afternoon. The jaw harps kick in after a few seconds. Genggong music keeps to a gamelan pace - pretty quick, in other words. It's one thing to watch musicians play gamelan instruments at that tempo; it was something else altogether to watch these guys do their thing. Thanks to The Big BM for the audio file. 16 toes front, 12 back. 1 transcontinental and 6 international flights. 6 countries. 13 houses. 1 pound aged parmesan reggiano, 1 can vegetarian refried beans eaten. 20-plus raw shrimp stolen from the kitchen counter. numerous woks licked clean of all traces of mapo dofu. 2 3-story falls, from the same dining room window. 1 9th-floor balcony railing tightrope-walked. 3 kittens put in their place. 7 dogs chased from the yard. 1 lizard vanquished. tens of dead mice and birds laid at our feet. 3 dog beds pissed on. countless balled-up paper bags fetched and returned. 3 mini trolls mauled to bald. 2 stuffed frogs and 1 plush strawberry dismantled. 1 big personality in 1 small body. there'll never be another like him. 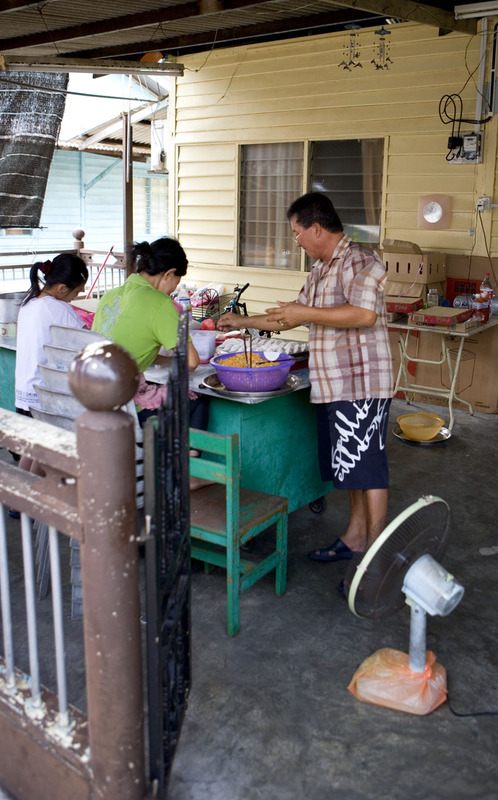 Once we were hip to the fact that a fair bit of food on Pulau Ketam is made in the villagers' houses and sold from their front porches, we took an extra hard look at the pretty wooden cottages we were passing on our bikes, lest we miss another edible treasure. We didn't have to look long; just up the street from the island's best chai kuih (OK, perhaps Pulau Ketam's only chai kuih, but that doesn't at all diminish their deliciousness) we found a memorable pan meen. The cook in question had a number of noodle dishes on offer, but she urged us to order something that incorporated her homemade fish cakes. 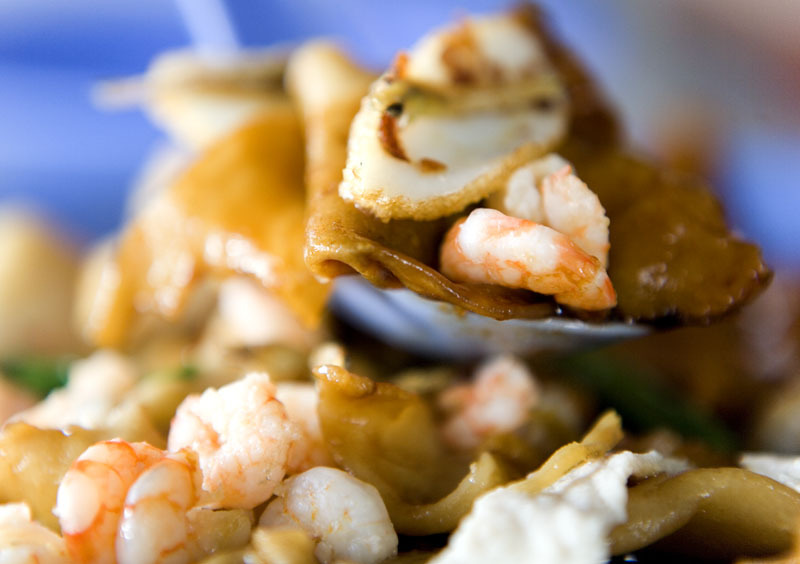 Rather than cutting her pan meen (thick, flat wheat noodles) with a knife, she tears them into rough squares, and the result is pasta with extra texture and chewiness. 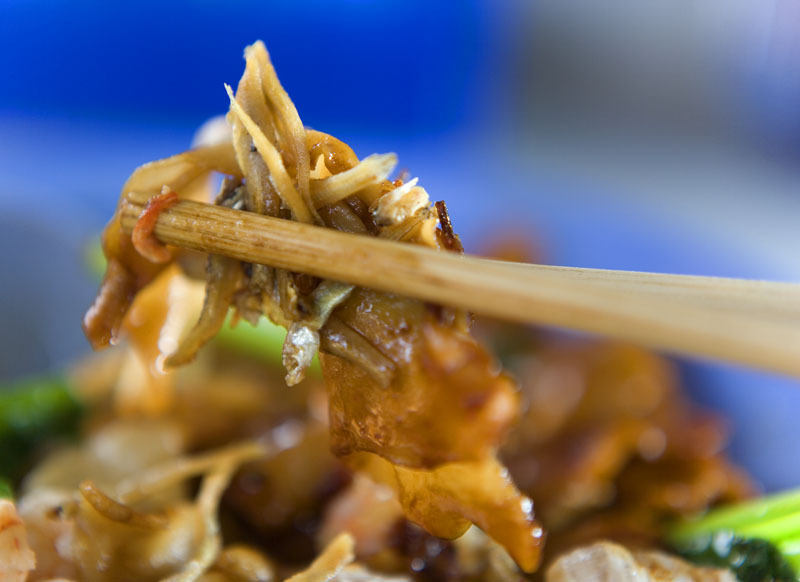 The dry version is served with crispy ikan bilis (dried anchovies), pork, and a few stems of choy sum - nothing new there. 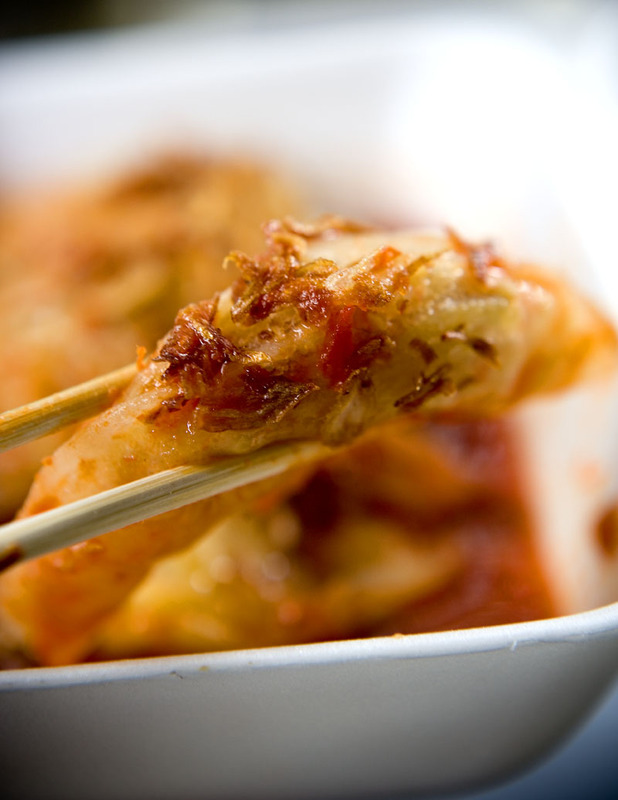 The highlights of the dish, other than the wonderful noodle squares, are the super fresh small prawns and the slices of fish cake which, as might be expected of fish cake made in a fishing village, taste truly of the sea. 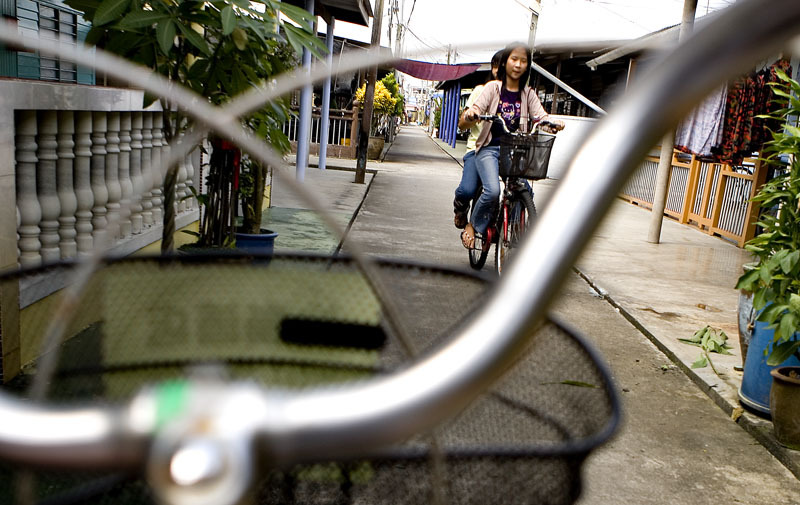 No doubt about it, bicycle is the mode by which to see Pulau Ketam. The island has few trees, and once the sun comes out there are few places to hide. But a single humped bridge aside, the streets (if you can call them that, most are just about two bikes wide) are flat so that it's easy to get a cooling breeze going once the pedals are in motion. Though Pulau Ketam is a good-sized island its raised walkways extend only so far; to cycle from the jetty to their end, if one rides with purpose, takes only about a half our. But there are enough tributary walkways (many of which are wood-planked rather than concrete and scarily narrow - you wouldn't want to tumble off the side and into the low-tide muck below) to keep the serious meanderer busy for a couple of hours. 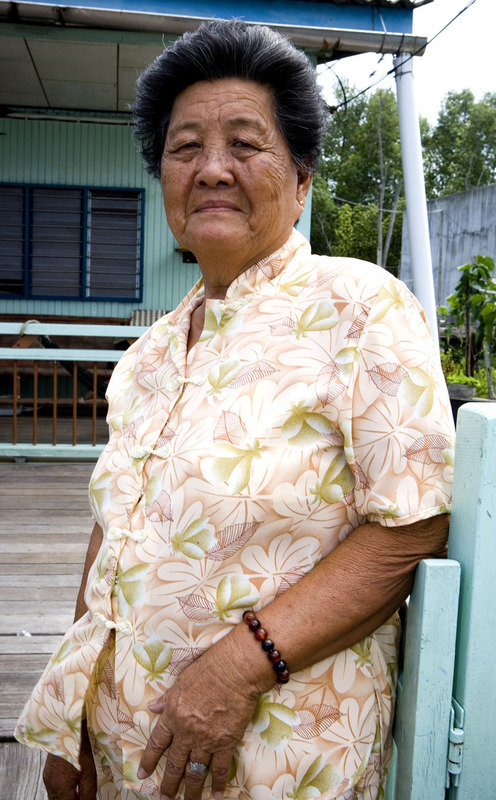 At the proverbial end of the road a helmet-haired septuagenarian emerged from her sky blue house, gave us a beady-eyed once-over, and invited us to sit for a spell on her front porch. As soon as we accepted she softened up considerably. She doesn't speak English and my Mandarin is as rusty as a saw left out in a summer rain but we managed to learn that Mrs. Hsieh's parents came to Pulau Ketam from China's southern Guangdong province and that she's lived in there all her life. We also learned that she and her six kids, one of whom remains on the island (her husband passed away years ago) produce bird's nests (you can see the concrete 'workshop', where the nests are laid and collected, just above her left shoulder). 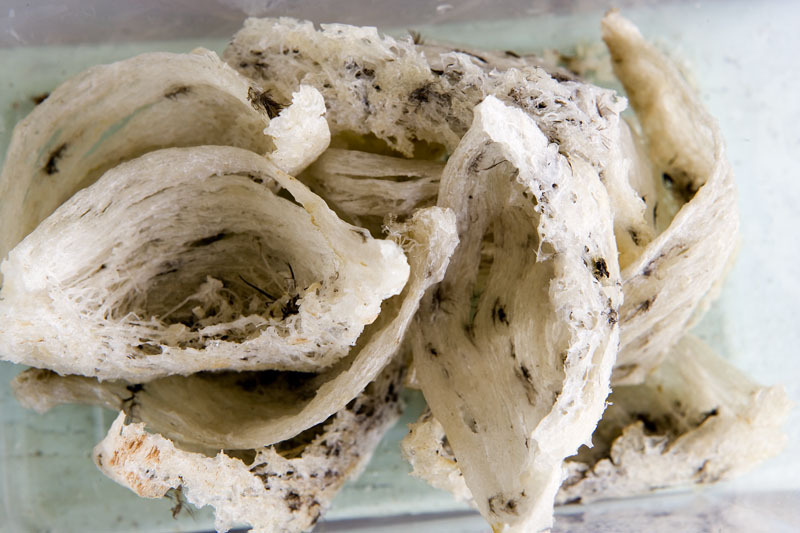 I'd only ever seen bird's nest in its finished form (below). 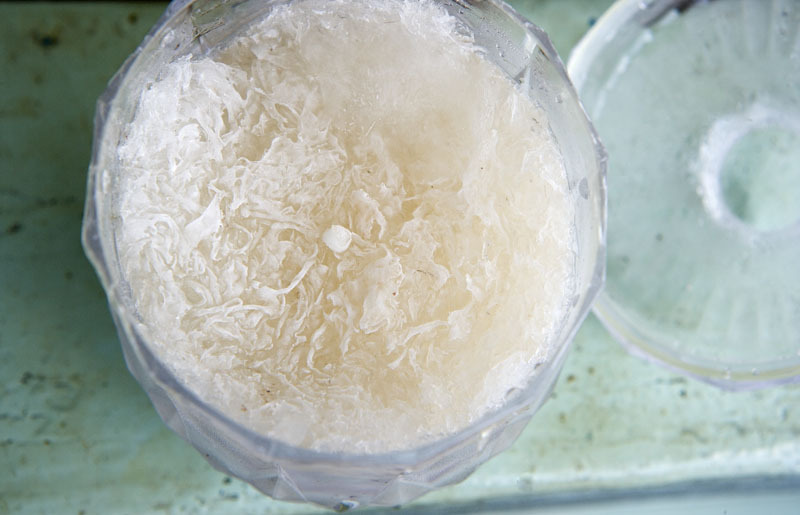 It's usually dissolved in hot water and drunk with a bit of sugar, or made into a sweetish soup. Very good for the health, I've heard, and if Mrs. Hsieh's spriteliness is any indication I'd have to say that's no bunk. Mrs. Hsieh was proud to show us some nests that had been gathered recently. 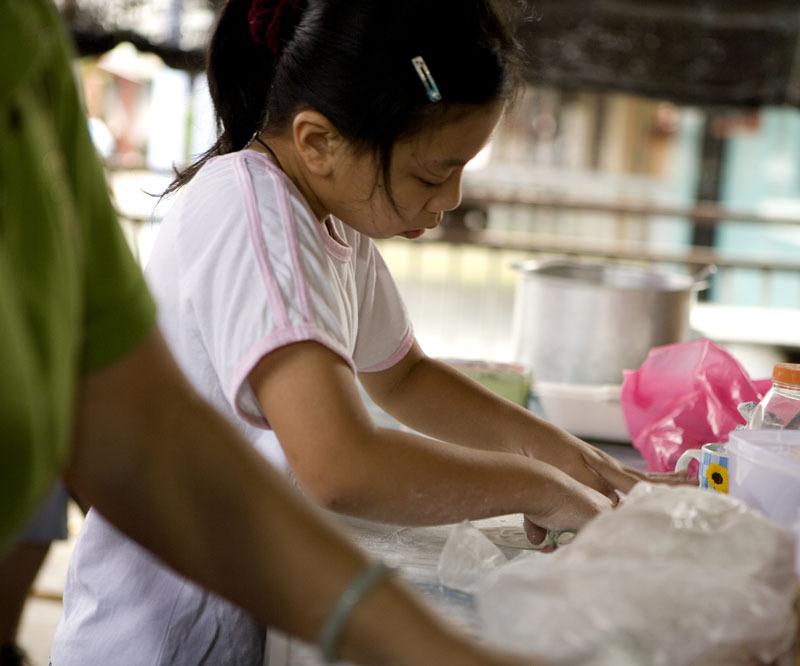 She and the family clean them up and boil them down at the back of her house. Supposedly 80 to 90 per cent of Pulau Ketam's population works, in one form or another, in the fishing industry. 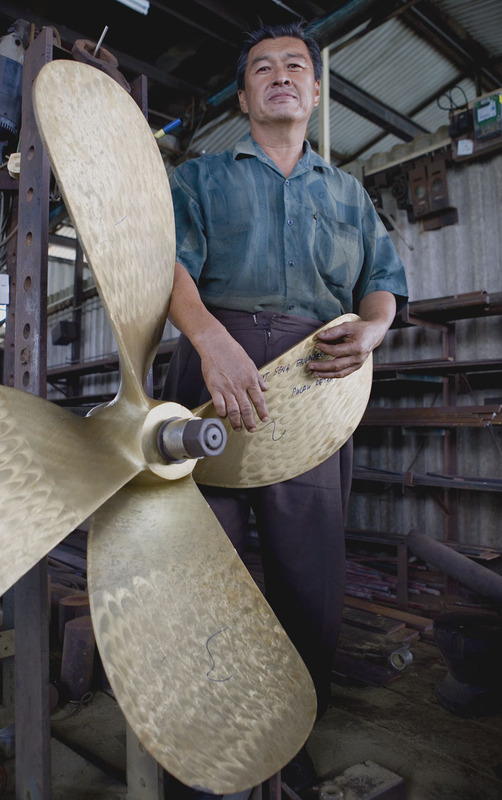 Mrs. Hsieh's son is no exception; he fabricates the massive bolts that hold fishing boat propellers to the rods that support them. His workshop is a fabulous double-roomed jumble of machinery, workbenches, odd parts, brand new propellers and retired, rusted specimens. It smells of grease and hard work and, because it sits right over the water, salt. 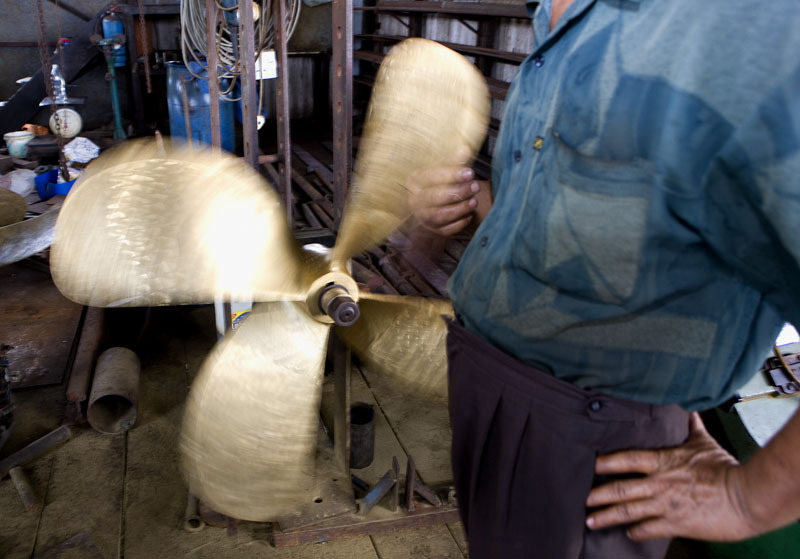 New brass propellers are things of real beauty; the pattern on the blades' surface looks just like wind ripples on the surface of an otherwise calm sea. Two thousand dollars (US) will get you a beauty to hang on your wall. We'd like to go back and spend some time there, watching this craftsman at work. All that flat-terrain cycling and shooting the breeze left us hungry, so on our way back to the charter boat (which,the captain had warned, would leave at 2 o'clock on the dot) we stopped for a snack. 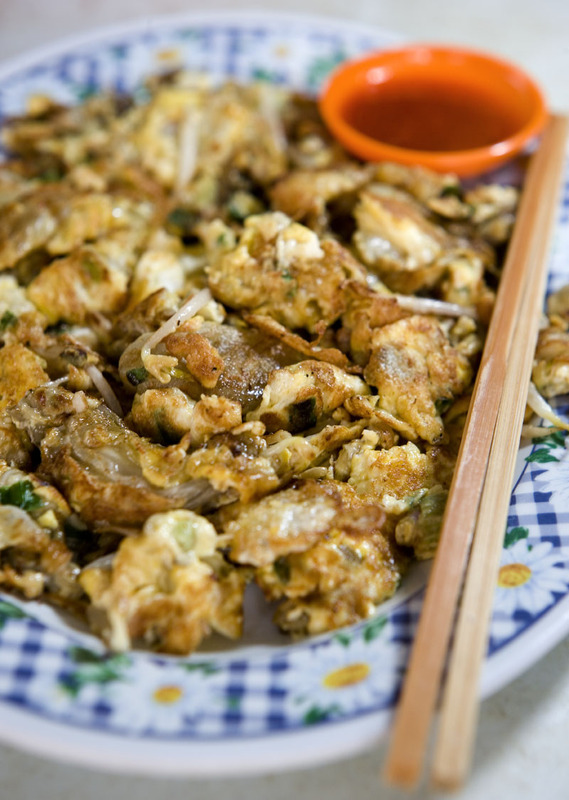 The oyster omelet cooked at a stall in front of Restoran Kin Hiong Heun on Pulau Ketam's main drag is justifiably famous. It's tender egg lightly folded around bean sprouts, chopped green onion, and plenty of not-too-big, and not at all overcooked, oysters. The accompanying dipping sauce is nothing to shout about, but the omelet is so good on its own the sauce is extraneous anyway. After returning our bikes and stopping to make the sort of purchases one absolutely must make if one goes to Pulau Ketam (prawn crackers, dried shrimp and oysters, and a dry relish made from chopped dried shrimp fried with dried chilies - good for stirring into hot rice or congee) we boarded the boat bellies full, faces crimson from the sun, and as refreshed as if we'd just had a long weekend away. Not a bad way to spend a Saturday ... or a twenty-second wedding anniversary. Pan meen, 319 San Ma Lu (San Ma Road), from about 10am. 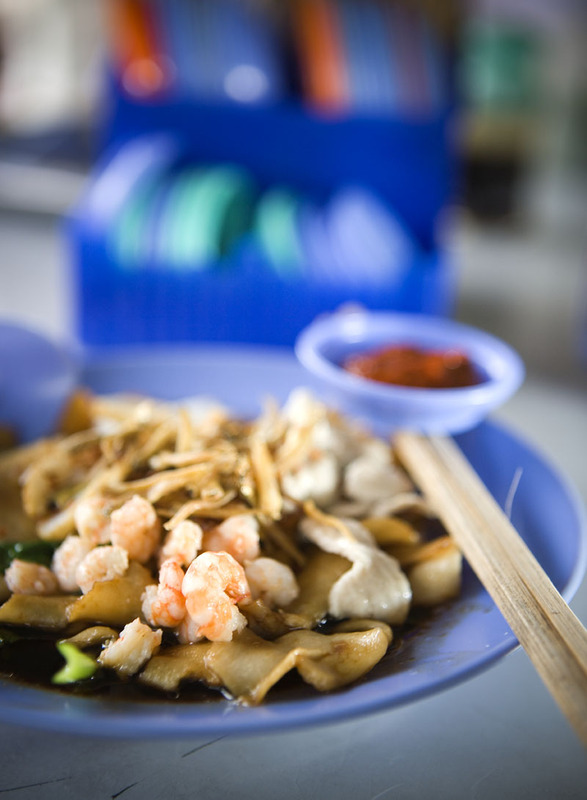 Oyster omelet (or clam, if you wish), stall in front of Kin Kiong Heun seafood restaurant, from about 9am. 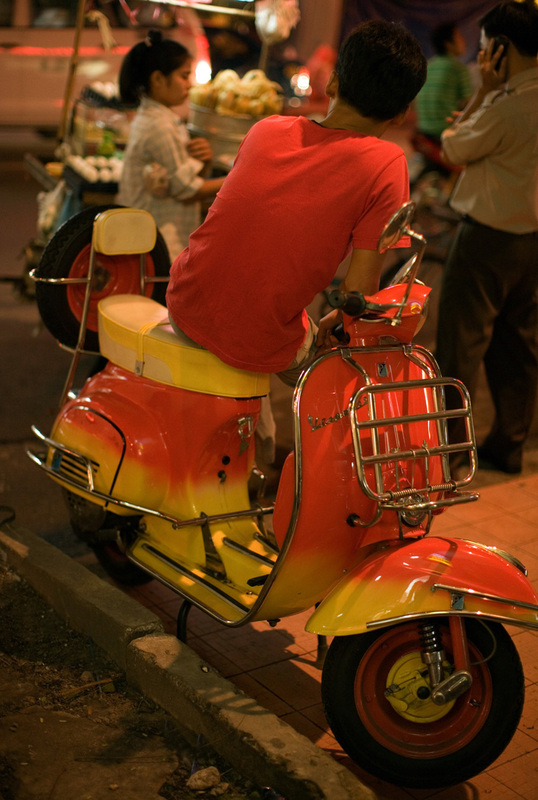 We've recently been working on an assignment that focuses on Kuala Lumpur and its surrounds. Over the last year we've become so occupied with for-print projects that vacations and weekends are no longer our own. Rarely do we have time, anymore, to wander without purpose, to open ourselves to spontaneity and aimlessly explore this place that we call home. We're not complaining - well, yes we are, a little - but how wonderful it's been these weeks to have an excuse to revisit the places and people and foods that we've come to love since we moved to Kuala Lumpur almost three years ago. Perhaps the best part is that, as a result, we're seeing some places in a new light. 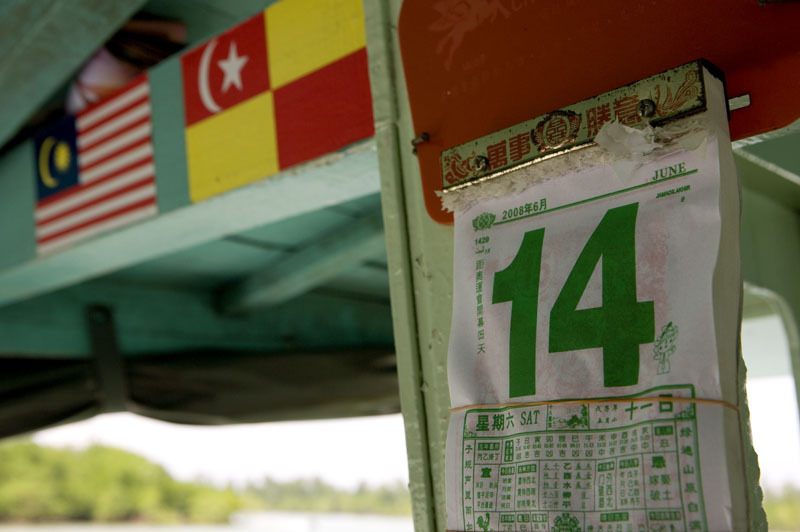 Last weekend we returned to Pulau Ketam ('Crab Island'), a small island just a hop, skip, and a jump from KL. On our last visit we and a gzillion other daytrippers disembarked the ferry at high noon. After a mediocre lunch at one of the crowded seafood restaurants on the island's main street we wandered around, sweaty and listless, under the unrelenting mid-day sun. Less than two hours after we arrived we left, sensing that we'd missed out on whatever it is that Pulau Ketam has to offer. This time we did it right, heading out from KL early on a Saturday and arriving at the jetty in time for the 9:30am ferry but, by luck, hitching a ride on an open-air charter boat instead. It was a slow chug-chug to Pulau Ketam (an hour on this craft, versus half an hour on the regular ferry) but an infinitely more enjoyable ride - with a wide-open view from the deck and the sea breeze in our face - than it would have been in the claustrophobic, capsule-like enclosed regular boat. Once on dry land we rented a couple bikes and headed out in no direction in particular. 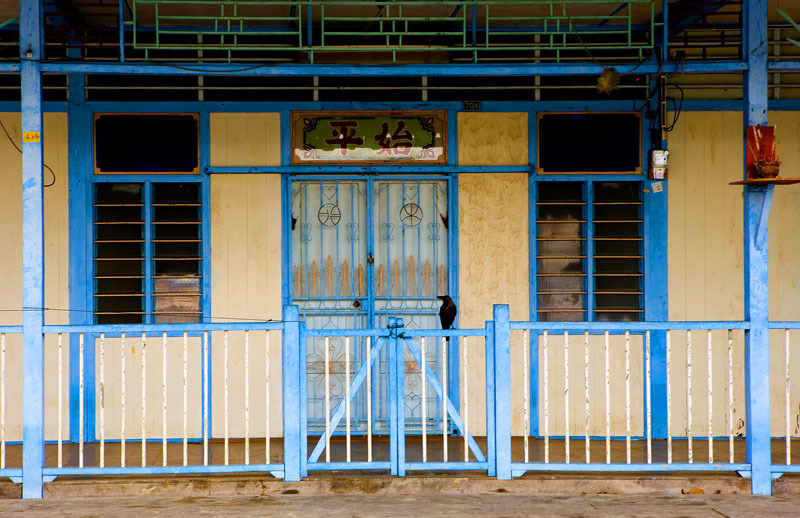 Cruising around at this rather cooler hour, with Pulau Ketam's raised concrete and wood-plank sidewalks almost to ourselves, we could more easily revel in the island's quietude and take in its colorful houses and many lovely and unusual Buddhist temples. 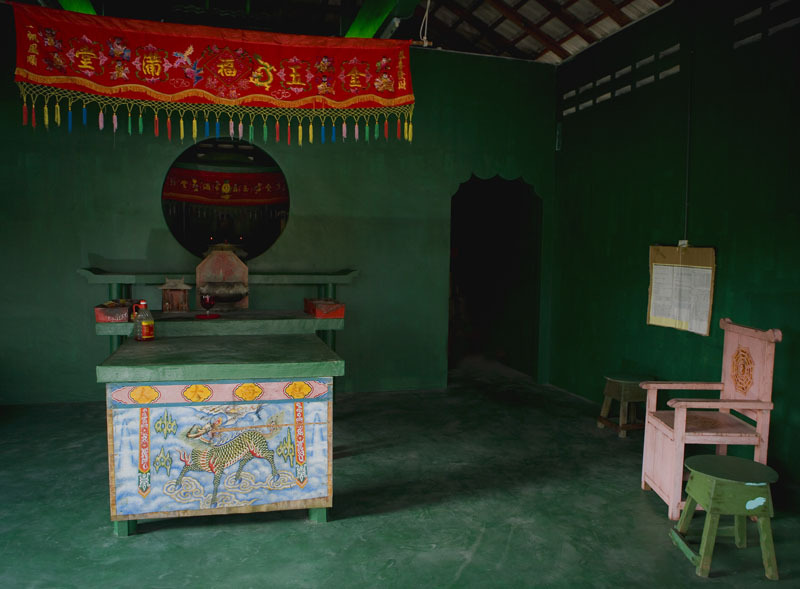 The interior of the one above, colored a deep jade green from floor to ceiling and and furnished with pretty hand-painted altar and geomancer's chair, is especially striking. Many shops had yet to open for the day, and some residents were still in their pajamas. As for nourishment, with no plans (other than to avoid a repeat of last visit's disappointing lunch) we were open to all possibilities. 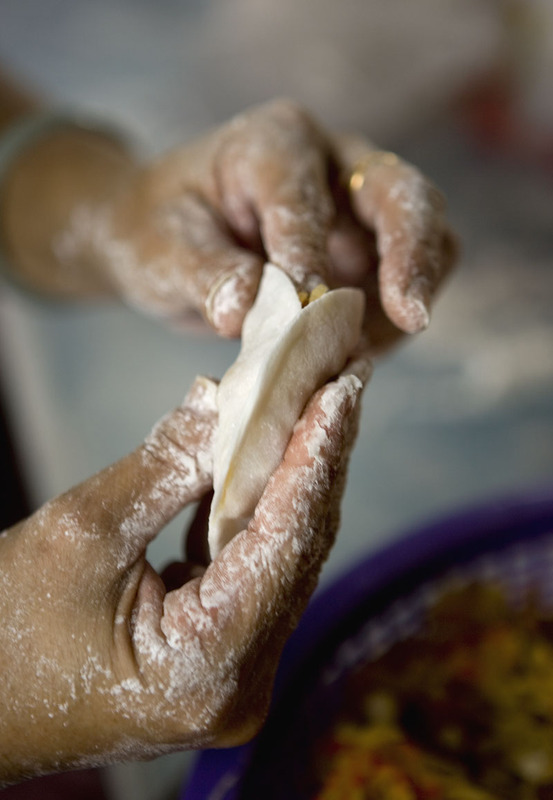 On one of the roads spoking off Pulau Ketam's 'main street' fate, and our bicycles, led us to a dumpling assembly line on the front porch of a yellow wooden house. 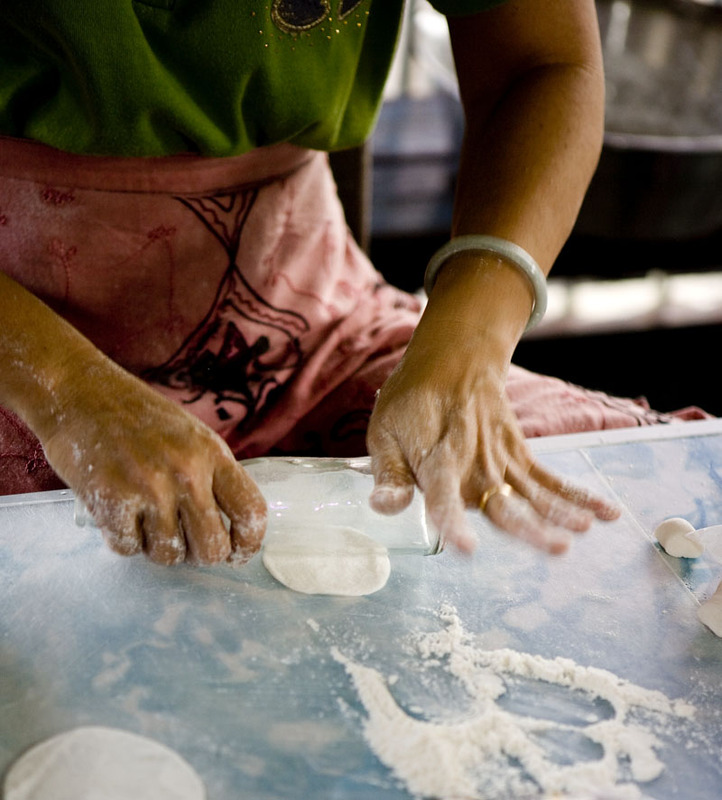 Ah Hong and his wife have been making and selling their chai kuih for about ten years. Their daughter helps out when she's not in school. 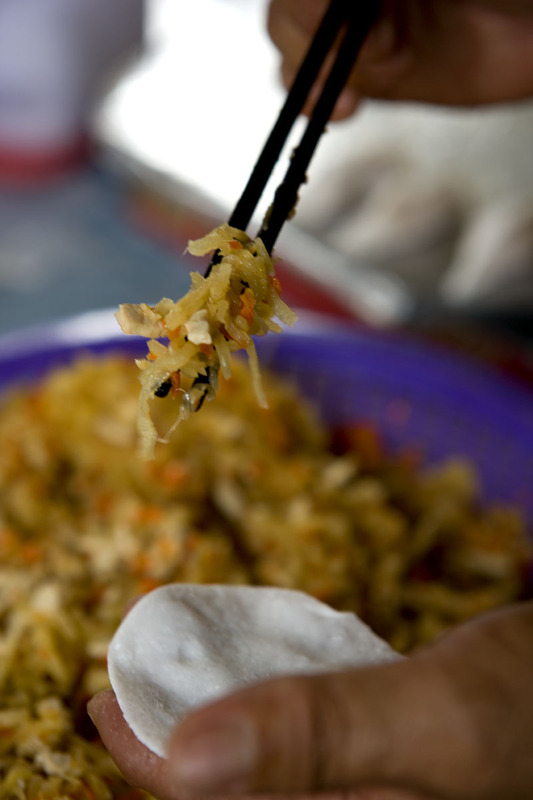 and their fresh tasting jicama-carrot-bean curd filling that's cooked long enough to tenderize the vegetables but not so long that all flavor and toothsomeness leaches out. After a turn in a steamer Ah Hong's family's chai kuih are sprinkled with crunchy flakes of freshly fried shallot and sold with a homemade dipping sauce that combines lots of garlic, fresh chilies, vinegar, and a hint of tomato, to transcendent effect. 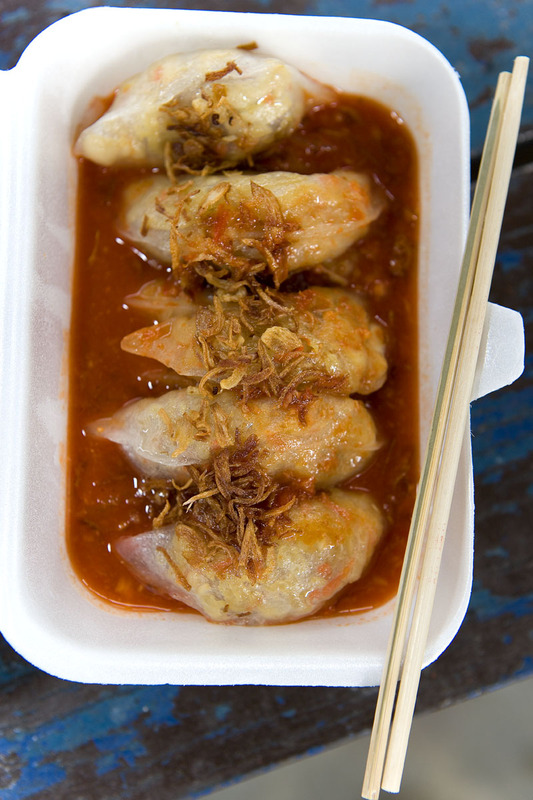 We had ours poured directly around our chai kuih and ate them then and there on Ah Hong's porch, oooohing and aaaaahing our way through the lot. The sauce was so tasty I had to restrain myself from drinking what remained after the dumplings were gone. It's almost a sin for chai kuih this masterful to be sold on Pulau Ketam, beyond the easy reach of us city dwellers. And more so to be sold unadvertised, well off the island's main food street, where most daytrippers will never find them. Chai kuih, 328 San Ma Street (San Ma Lu), Pulau Ketam. Sold every morning, except on public holidays. We just received a bunch of hot-off-the-press copies of Lonely Planet's new KL, Melaka & Penang guide, to which Dave contributed some photos and for which I wrote the introductory Food and Drink chapter. Frankly I don't know what we'll do with them all, so to celebrate finally seeing the fruit of our labors one year after the fact we're giving away a couple copies. Here's the deal: be the 25th and 26th person to send me an email and the guide's yours. 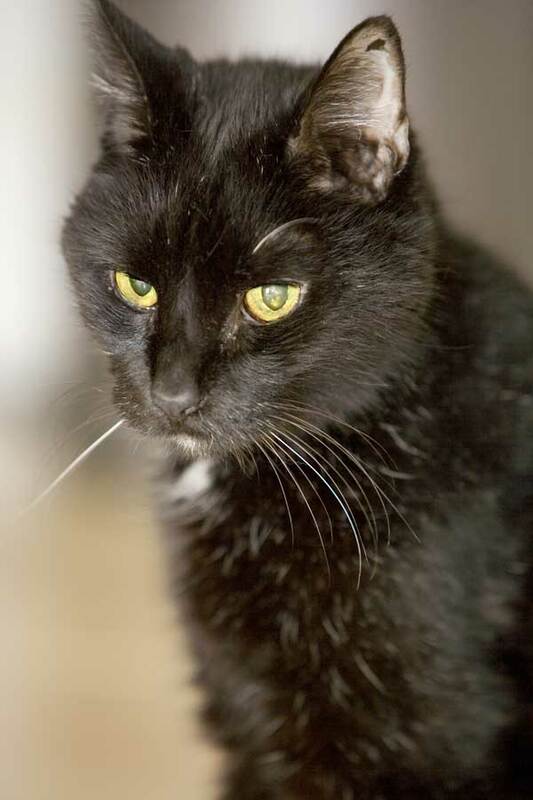 If your bid is successful we'll contact you for your address and then send the books out regular mail. We'll add an update to this post as soon as we have our winners. Good luck! Update: (10:45 Malaysian time, Fri) - still have quite a few to go before we hit 25 and 26. No problem with multiple entries, so if you've already sent an email feel free to try again.... (thanks for the kind words, by the way). Update, Sat: We've got a couple winners. If you're one of them we've sent you an email. Thanks to everyone who entered, and for your kind words. Officially fruit, but in practical terms this sukun (a.k.a. 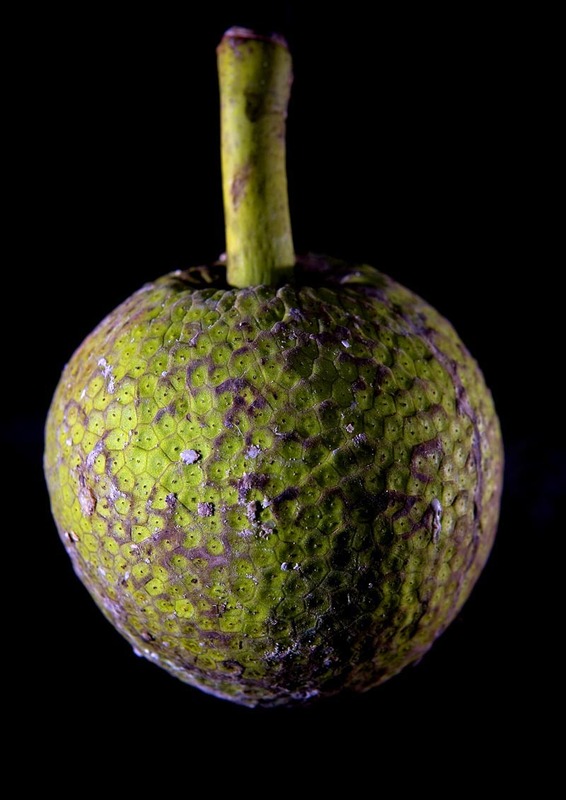 breadfruit) possesses the qualities of both fruit and vegetable, depending on when it's eaten. We were gifted this specimen by a favorite vegetable seller at Kuala Lumpur's TTDI Sunday night market. She had just a few, all from her own tree. I didn't recognize it as a breadfruit because the specimens I'm used to seeing are oblong-ish and much, much larger, like a jackfruit. This baby wasn't even 6 inches in diameter. In Malaysia breadfruit is usually eaten young (unripe), coated with flour and deep-fried. You'll often find crispy breadfruit slices sold alongside sweet potato and banana fritters. It tastes like, well, bread - all well and good I suppose, but not particularly interesting. We took our baby breadfruit home and left it on the counter. When we got to it a couple days later - surprise surprise - it was soft. Cutting it open without squishing it and peeling its skin without also pulling off a good bit of flesh was a challenge. I tasted it raw and loved its texture - smooth, soft, and buttery, like an overripe avocado or the finest Malaysian durian - and wonderful banana-pineapple-with-a hint-of-citric-tartness flavor. I dipped a couple slices in flour and fried them as our veg vendor had advised. The texture was pleasing enough, like a deep-fried plantain, but the breadfruit's specialness - that lovely tropical essence - had disappeared. The next day I tried again with the leftovers. I figured if I undercooked the fruit I might be able to preserve its custard-like texture and subtle flavor. The fact that it was chilled through was a good start. I dropped a knob of butter into a saute pan and let it sizzle, then added a hefty shaving of gula Melaka and swirled it around in the pan to melt a bit (but not completely). I then slid in a few thick slices of breadfruit, and left them in the bubbling butter just long enough to barely brown all sides. Eureka! What I ended up with were slices of breadfruit bathed in golden butter and stuck here and there with smoky, caramel-like bits of gula Melaka. They were barely firm on the outside, warm but still pudding-like within, and tasted very much like, well, a deliciously fragrant tropical fruit rather than a piece of bread. A scoop of vanilla ice cream would have worked here. Think banana and pineapple flambe without the booze. This experiment got me wondering why, in this land of durian made into ice cream and pastries, the same isn't done with breadfruit (or is it? Breadfruit is incorporated into sweets in Thailand, by the way.). Malaysians seem to love their breadfruit as a vegetable, but is anyone here eating it as a fruit? a big knob of butter (not margarine! ), about 3-4 Tbsp. 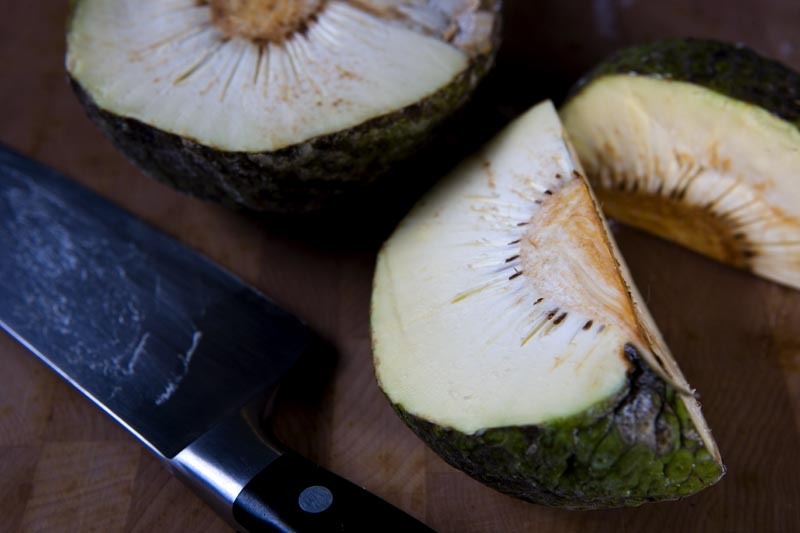 Cut the breadfruit into slices about 1 inch/2cm thick. Heat the butter in a (preferably non-stick) over medium-high heat till sizzling. Add the gula Melaka and stir or swirl the pan to melt it a bit. Slide in the breadfruit and cook VERY briefly on each side. The fruit should remain soft. 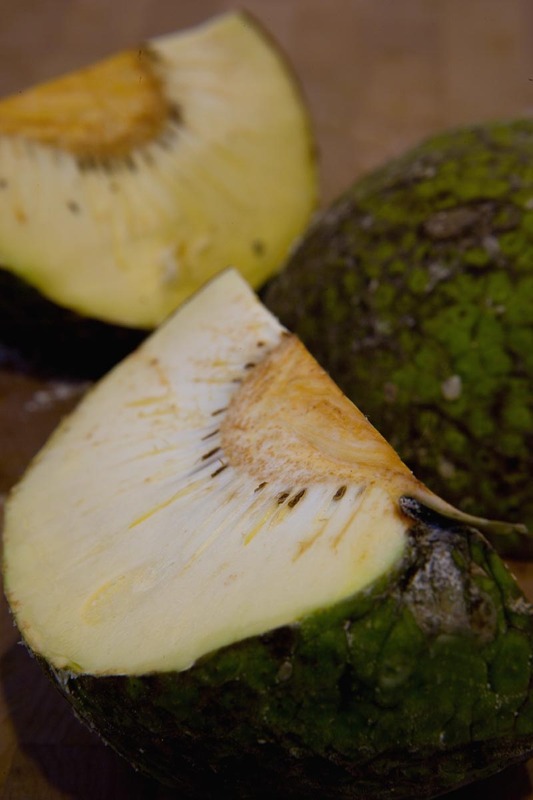 Remove the breadfruit to a plate and pour butter and gula over it. Serve immediately. This dish has absolutely nothing to do with Asia, other than the fact that I cooked it in my Malaysian kitchen, but sometimes a good recipe should be shared whether or not it fits the theme of the food blog. And a dish this rich and meaty is probably not going to appeal right now to most of our in-the-grip-of-summer North American readers, but I know that somewhere in the world it's daube weather. I cooked goat for the first time just a few months ago, in a spicy coconut milk-based goat curry. The dish was delicious and got me wondering what else I could do with the other red meat. It was Dave who suggested goat daube (a daube is wine-based stew). He'd been thinking about the string of Decembers we spent in a rented farmhouse in Piemonte. Not surprisingly (it's Italy after all, and this was before the precipitous drop of the US dollar) those weeks were all about eating and drinking and cooking and the sporadic sightseeing that occurred on the way to and from open markets and shops and osterie and trattorie and restaurants. One of our most memorable Christmas Eve meals was a Provencal daube made with bue grasso beef that we purchased from the local butcher. 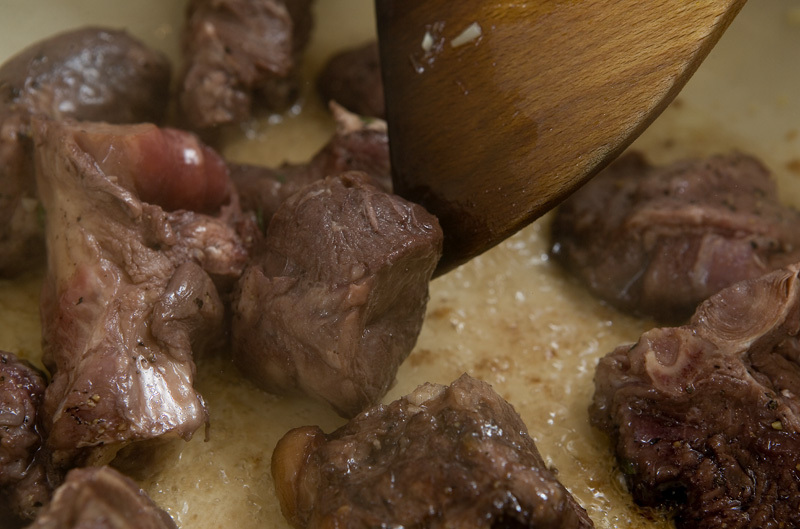 The daube recipe was one I'd followed a bunch of times at home, but made with Piemonte's exceptional beef it was an altogether different - and tastier - animal. Bue grasso tastes stronger, more minerally, and, for lack of a better word, beefier than American beef. That Christmas Eve daube was so good, in fact, that I never made the dish again, unless we were in Piemonte. Until a month or so ago, when Dave suggested I substitute goat for the bue grasso. It's not a true substitution, of course - goat is a bit gamey and awfully tough. 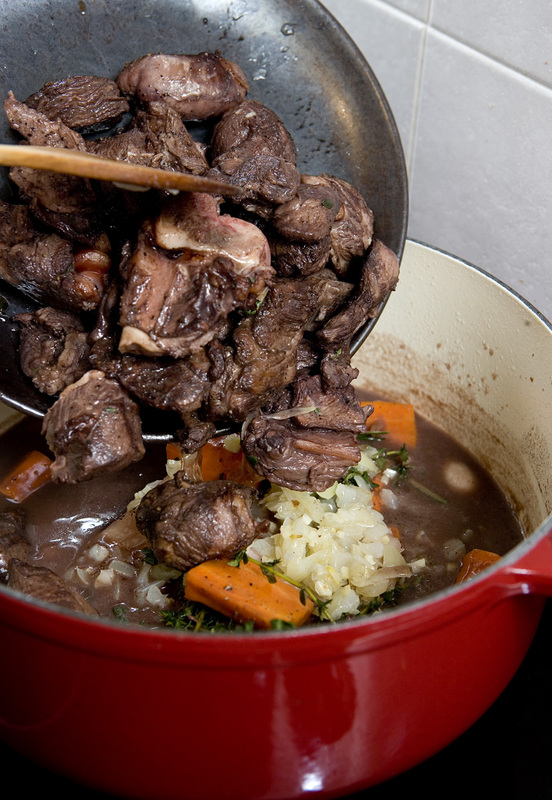 But, we thought, tamed by the overnight soak in red wine that this recipe calls for and stewed slowly for a good, long time, it might give the daube the sort of extra 'edge' that it gained from the Piemonte beef. Long story short - we were very happy with the rich, uber-meaty daube, in which goat and dry red wine played off each other beautifully. We ate half the day I made it and stuck the rest in the freezer. Leftovers, eaten for dinner Sunday night, were even tastier than the first round. 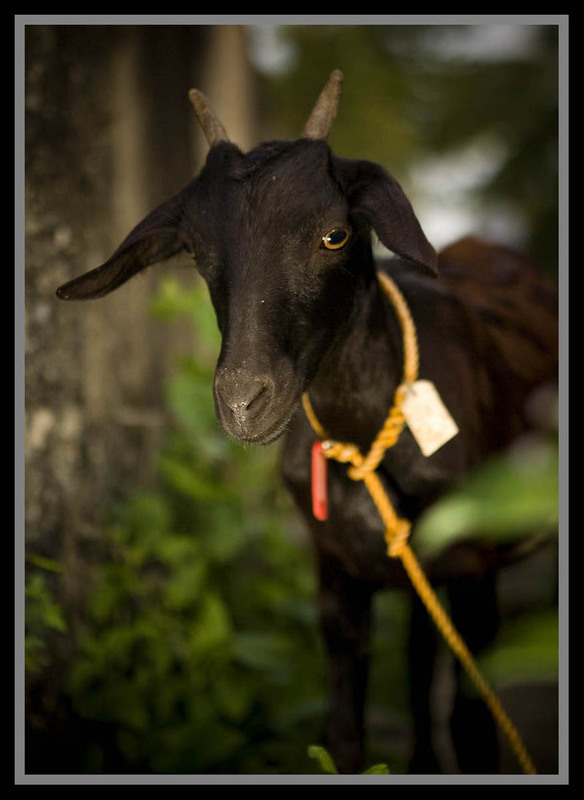 Most every KL wet market has a mutton and goat vendor (or five), and that's where I purchased the goat meat. I told the butcher I was making curry and asked him to leave the bones in when he chopped up the meat. 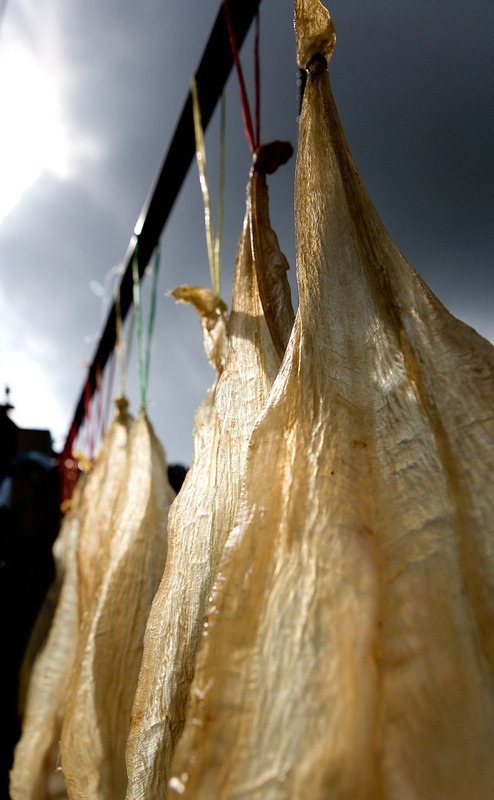 Ten years ago I might have found eating a dish made with bone-in meat a pain in the rear, but living in Asia has inured me to the hassle of negotiating my way around bone bits; I've also come to realize that the extra flavor bones lend to slow-simmered dishes are more than worth the effort of dealing with them at the table. If I really don't want bones in a stew or soup I remove the meat from the finished dish, let it cool, and then add it back in after I've deboned it. But for cooking, bones stay in. 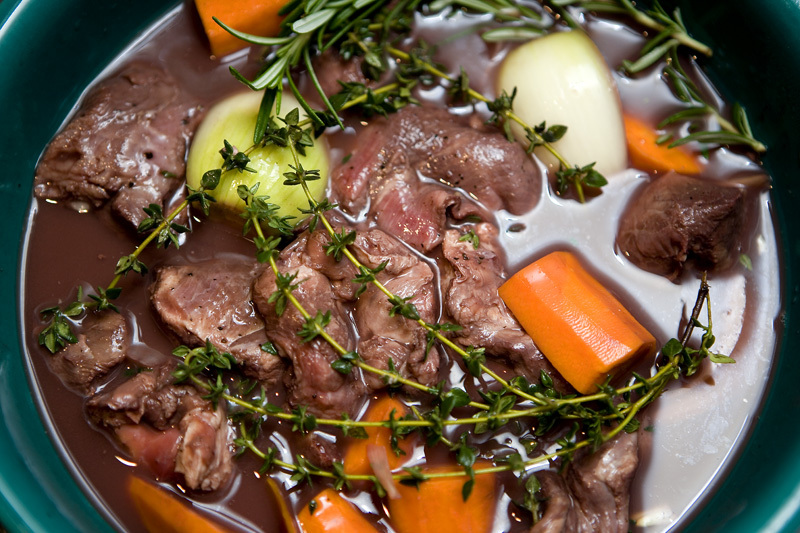 This goat daube must be started 24 hours ahead, so the meat can soak overnight in (a whole bottle of) red wine. Also in the drink are carrots and onions, freshly ground pepper and salt, fresh thyme and rosemary branches, bay leaves, garlic, and a couple strips of fresh orange peel. 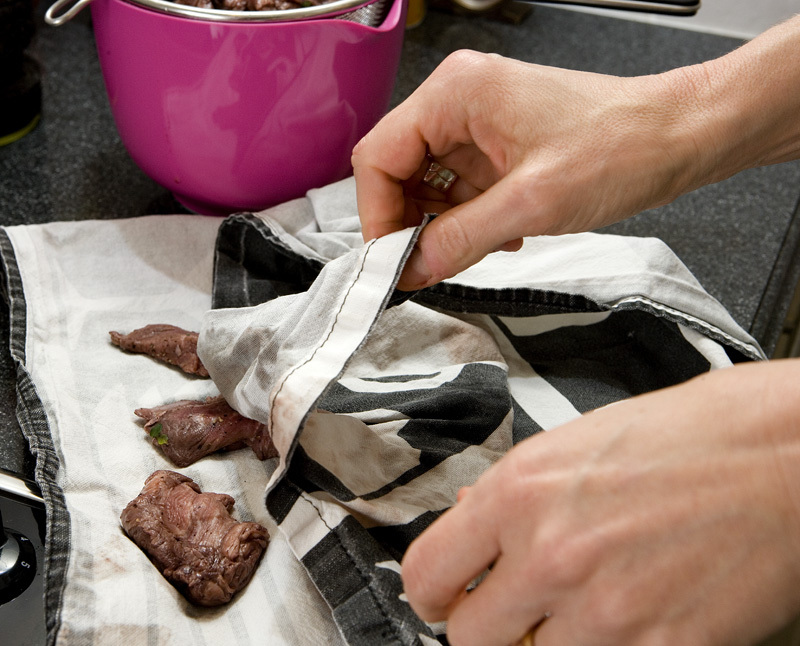 When it's time to cook the daube, remove the meat from the marindate and pat it dry, so that it will brown well. First, chopped onions and minced garlic are sauteed in vegetable oil or, if you wish, pork fat. After they're removed the goat is added and browned off, then removed from the pot and set aside. and then in goes the marinade. some water and, finally, a few dried mushrooms (porcini or cepes). The stew is simmered, covered, on the stove (it could also be placed in a hot oven) until the goat is tender - which took about 3.5 hours this time around. From pulling the marinated goat from the refrigerator to putting the cover on the pot to simmer took maybe 45 minutes max. Once it's cooking away you're pretty much golden ... not much to do except check the stew every half hour or so to see that it's at a gentle simmer and that sufficient liquid remains to keep things from sticking. 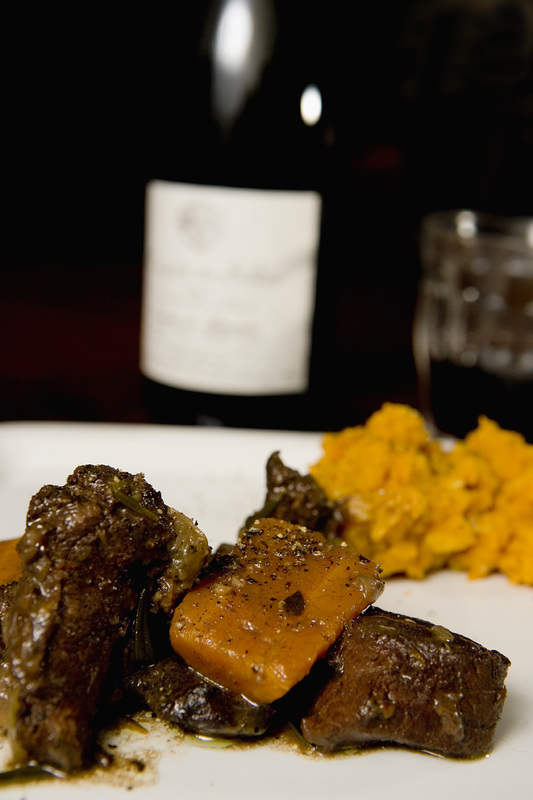 Daube with a (goaty) difference - we like it served with a grind of pepper and a mash of potatoes and winter squash. 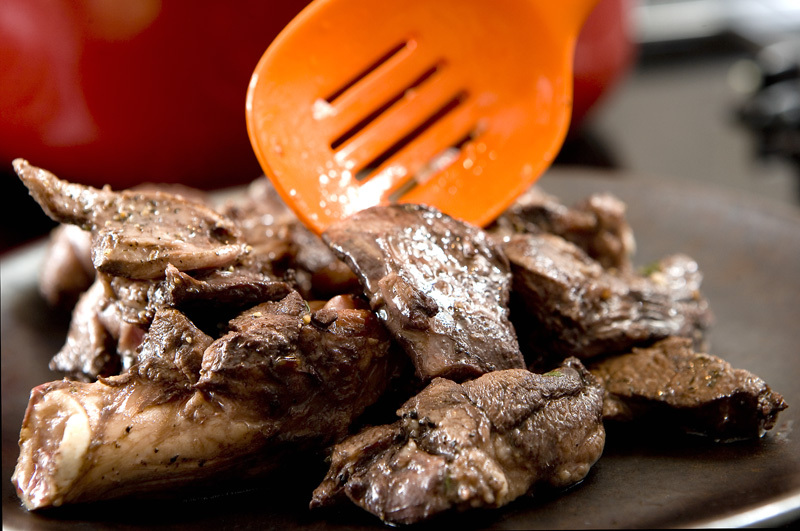 Trim and discard any large pieces of fat from goat. Place it in a non-reactive bowl, add 1 onion (quartered), carrots (peeled and cut into 2-inch pieces), 2 cloves of garlic, herbs, 1 teaspoon of salt, 1 tablespoon pepper, and orange zest. Pour the wine over all and turn to mix and immerse the ingredients. Cover and marinate overnight in the fridge, stirring occasionally to make all ingredients get a good soak. 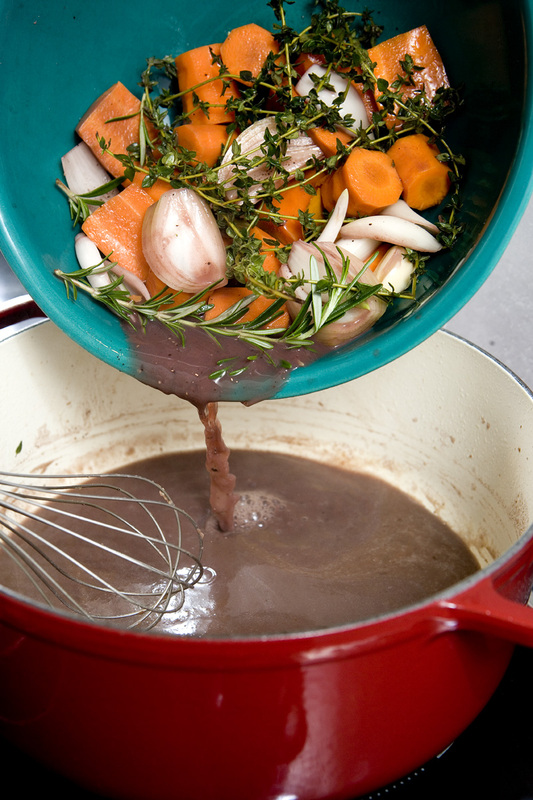 To cook the daube heat 2 tablespoons oil (or pork fat) in a large heavy casserole or Dutch oven over medium heat. Add the remaining onion (diced) and garlic cloves (minced) and saute till their translucent, then remove with a slotted spoon and set aside. Drain the meat and reserve the marinade. Pat the meat as dry as possible and then add to the pot a few pieces at a time to brown (don't overcrowd the pot or the meat will steam). Saute for about 5 minutes, turning to brown all sides, then remove with a slotted spoon and continue till all meat is cooked. 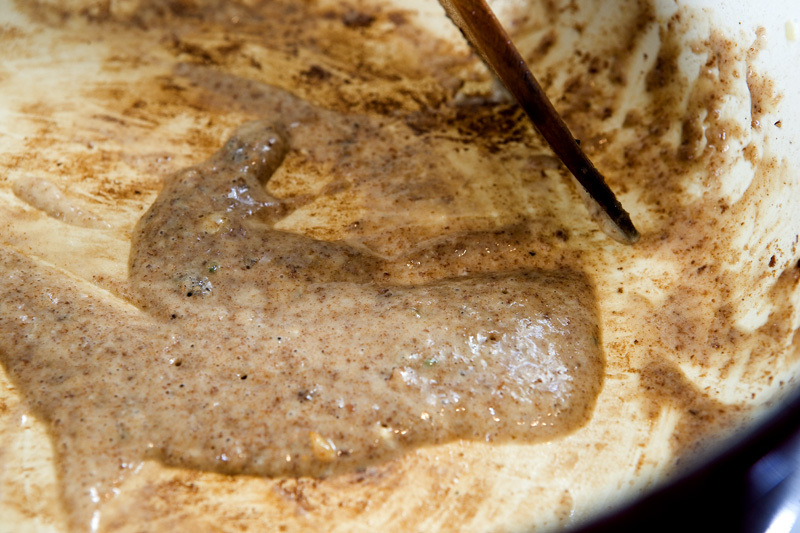 Add the flour to the pan and cook until it browns, stirring often. Raise the heat to high and slowly pour in the marinade liquid, deglazing the pan by stiring up any bits clinging to the bottom. Add the rest of the marinade ingredients, then the onion, goat, 1 teaspoon salt, and more ground pepper to taste. 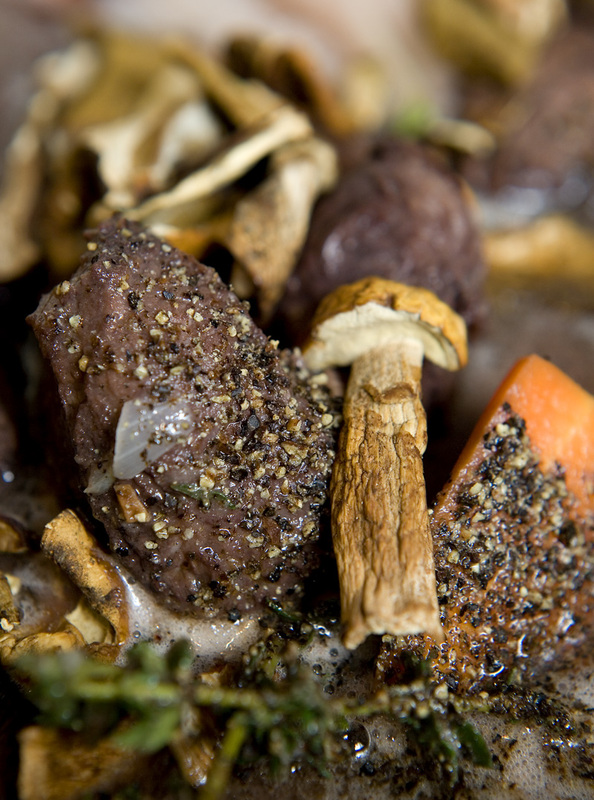 Throw in the dried mushrooms, pour in the water, and bring the mixture to the boil. Reduce the heat to very low, cover with a lid, and simmer until the goat can be cut through with a spoon, 3-4 hours. 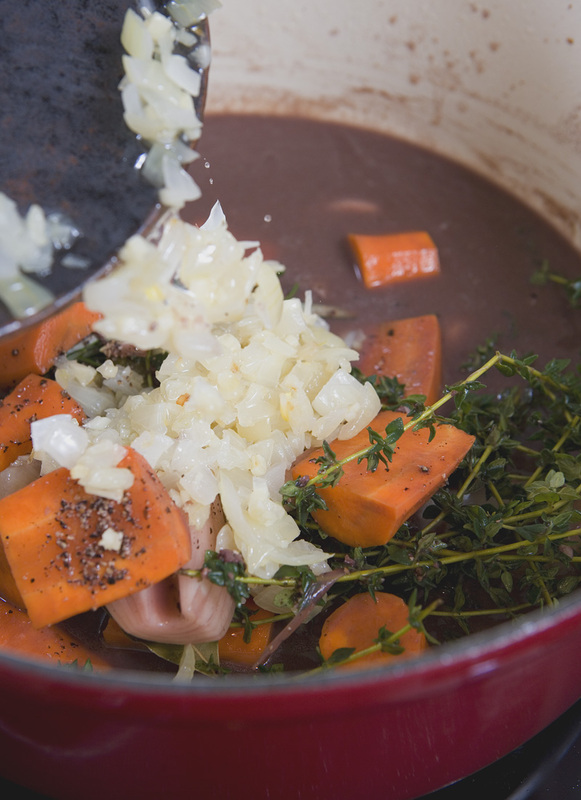 Once the daube is cooked skim off some of the fat and serve sprinkled with parsley (optional), with pasta or a mash of potatoes and sweet winter squash.